Commenter seguetonowhere points out a useful Android keyboard feature I missed in my original Froyo rundown: if you swipe your finger over the top of the Android 2.2 default keyboard, it will extend two more rows out and show you keys for common punctuation and numbers. Click on the thumbnail to see the expanded keyboard. This is a faster way to punctuate and/or add numbers than tapping the ?123 key or tap-and-holding the period key. However, as seguetonowhere points out, parentheses aren’t included on the two extra rows of keys in the extension. It took me a few tries to get the swiping motion just right, and this doesn’t work with my favorite alternative swipey keyboard ShapeWriter/Swype/SlideIT. 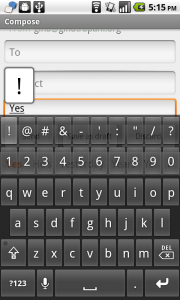 But definitely a must-know for Froyo users who use the default keyboard. Other keyboard shortcuts: You can swipe to start voice input, configure multiple languages and swipe across the Spacebar to switch between them, tap and hold the dot and .com keys to reveal more choices (like .org, .net, .tv), and tap and hold the : -) key to choose from other emoticons, too. Whoops-thanks for the catch! Fixed. Still anxiously awaiting the Froyo OTA for the Motorola Droid. 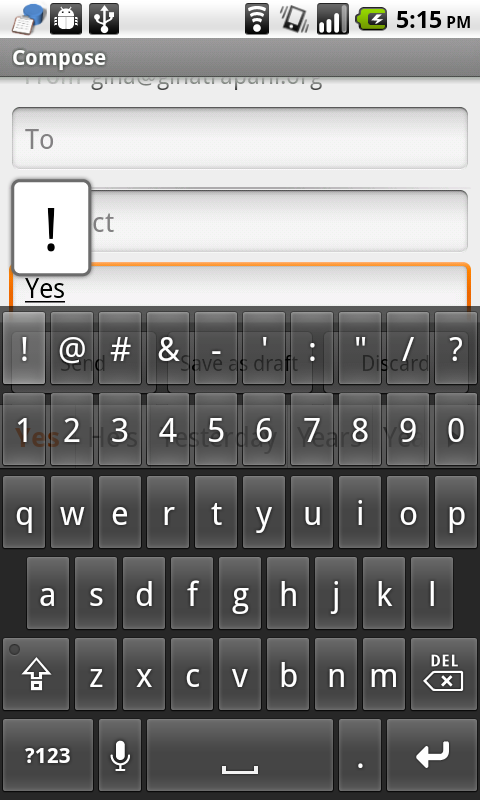 In meantime, I tried the Droid X Keyboard that was ported to 2.1, http://bit.ly/bbYyN5. Doesn’t have the Swipe up feature, but I like the spacing on the keys better when in portrait mode. I haven’t been able to get that to work. Can anyone post a video? My initial attempts brought up the voice input..but I can’t get that to work either.